If you are pregnant and experiencing morning sickness or fatigue, this energy drink is the perfect pick me up that is totally healthy during pregnancy. Made with fruit juice, protein and B vitamins, this delicious drink is hydrating, prevents nausea and provides energy for anyone who is feeling a bit run down. Get your free Healthy Mama Boost it Up! Caffeine free protein energy drink with this coupon. 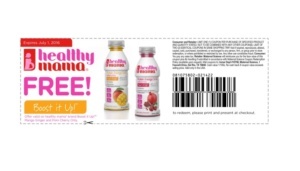 Print off this coupon to claim your free drink.